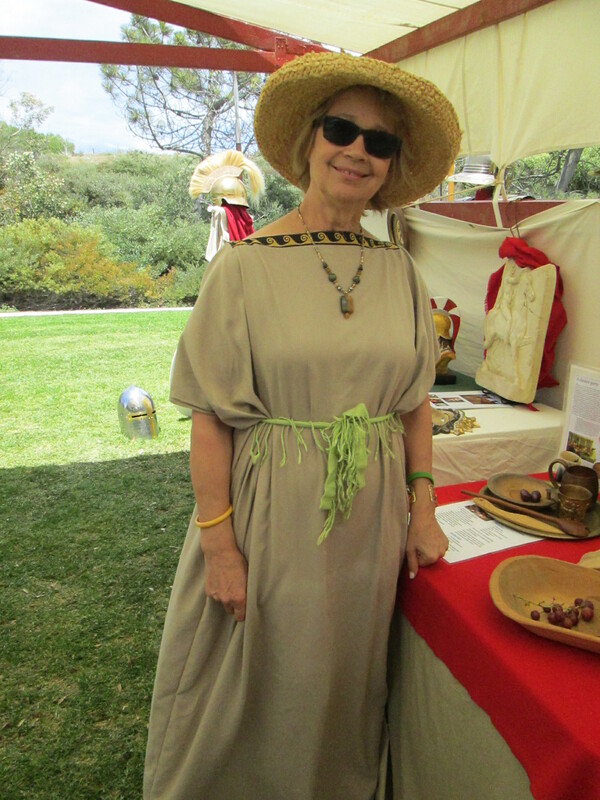 Martine and I love attending the large military re-enactment encampment at Old Fort MacArthur in San Pedro. Last year we missed it because I was still in Iceland, but today we spent the whole day at the Old Fort MacArthur Days event. It’s not that we were interested in the shooting events with all their noise and smoke: It’s just that it feels like walking through history. The Legio X Fretensis (“of the sea strait”) actually existed. It was established by Augustus (then called Octavius) Caesar around 40 or 41 B.C. to fight during the Roman civil war. It lasted almost 500 years, fighting in the civil war that saw the end of the Roman Republic, plus two of the Roman-Jewish wars in Palestine. Some elements of it fought with Marcus Aurelius. In San Pedro, the members we saw belong to a group that calls itself an “educational service organization” whose purpose is to instruct people about the Roman army, particularly in the First Century A.D. I enjoyed stopping by their tent for a few minutes to talk to the well-informed lady pictured above. As you may or may note know, I am a Roman history nut who has read all the works of Tacitus and many of his contemporaries. I am always delighted to find people who not only are well read in the subject, but can add to my knowledge. During the next few days, you will see a few more postings about some of the things we saw during the re-enactment. By the way, Old Fort MacArthur is not named after General Douglas MacArthur, but after his father, General Arthur MacArthur, Jr., who was Governor-General of the Philippines after the Spanish American War. It seems to me his son also had some dealings with that particular archipelago…. Let us say we were seated across the table from an ancient Roman and, say, a Viking. Aside from the obvious language problem, would there be enough commonality to allow for a spirited discussion? I think there would be, primarily because I have read enough Roman and Viking (I should say Icelandic and Norse) literature to vouch for the fact that, when all is said and done, we are not all that different from one another. “Ingigerth is the most beautiful of all women” next to a picture of a slobbering dog. You can find more about the Pompeiian graffiti by clicking here. The runes at Maes Howe are explained here. I am curiously torn about David Petraeus, who just resigned his post as Director of the Central Intelligence Agency (CIA) after admitting to an affair with another woman. This is not standard operating procedure in American political life. Usually, it is preceded by a sleazy denial, which nobody believes. And then there is an onslaught from the media, who troll for salacious details damaging to everyone involved, their families and friends. No, either the General is a compulsive truth-teller or he is afraid of being blackmailed. Let me see, are there any compulsive truth-tellers in the military or political arenas? I suspect not. It’s too radical an idea for now. As I said at the outset, I am of two minds about Petraeus. On one hand, he was appointed by George W. Bush, which immediately made me suspect him at the outset. At the same time, he is probably the most effective U.S. military leader since World War II. He reminds me of another general, some sixteen hundred years ago, who administered a decisive defeat to Attila the Hun at the Battle of the Catalaunian Plains in A.D. 451. Flavius Aetius (396-454) was called “The Last of the Romans” for his victory. Could Petraeus have won in Iraq and Afghanistan? I doubt it, because the enemy is hydra-headed. There are so many warlords and involved parties that, when one was beheaded, others would spring up. Remember when we killed the head of Al Qaida in Iraq? That didn’t accomplish anything in the long run. He was simply replaced. There are plenty more cockroaches-in-waiting to assume the job. In general, our times keep reminding me of The Decline and Fall of the Roman Empire. Today’s Los Angeles Times predicted that the Chinese economy would overtake us within four years. Oh horrors! (Not that it matters: By then China will be a polluted, smoking ruin from ignoring certain simple responsibilities of governance.) What with global climate change and the staggering world economy, there is an end-times feel to the decade. Not that we won’t somehow prevail in the end by dumb luck or changing our behavior. Men like David Petraeus are rare in our society. Too bad.